How do we get your upper windows looking as sparkling clean as they did on the day they were installed? 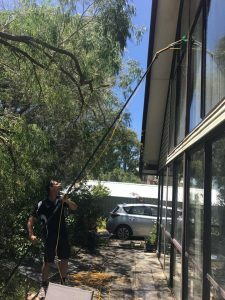 We use a unique 3-in-1 water de-ioniser cleaning brush which features a soft non-scratch brush, a water hose and a lightweight telescopic pole that adjusts to the right length so we can reach higher than 20 metres without a ladder, lift or scaffolding. This water fed pole system contains a series of filters that allow us to use 100% pure water to clean your glass. Combined, the special brush and pure water give your windows a streak-free finish every time. We can then access and wash just about any window on your residential property or commercial building. Although soft, the brush is powerful enough to fully scrub, wash and rinse the window, breaking down the dirt in the process. It’s perfect for blasting away mildew, grime, dirt, dust and even bird droppings. It’s the best way to clean windows. As we’re only using pure water, we leave the windows to dry naturally to avoid leaving any smears and ugly streaks on the glass. Window washing has never been easier! Our clients love that we can do a superior cleaning job quickly and easily without any safety risks. We’ve done it for them, we would love to do it for you, too. Call us on 0414 820 986 or send us an email to request a free, no-obligation quote today.